Jane Theodore lives and paints in Toronto, Canada. 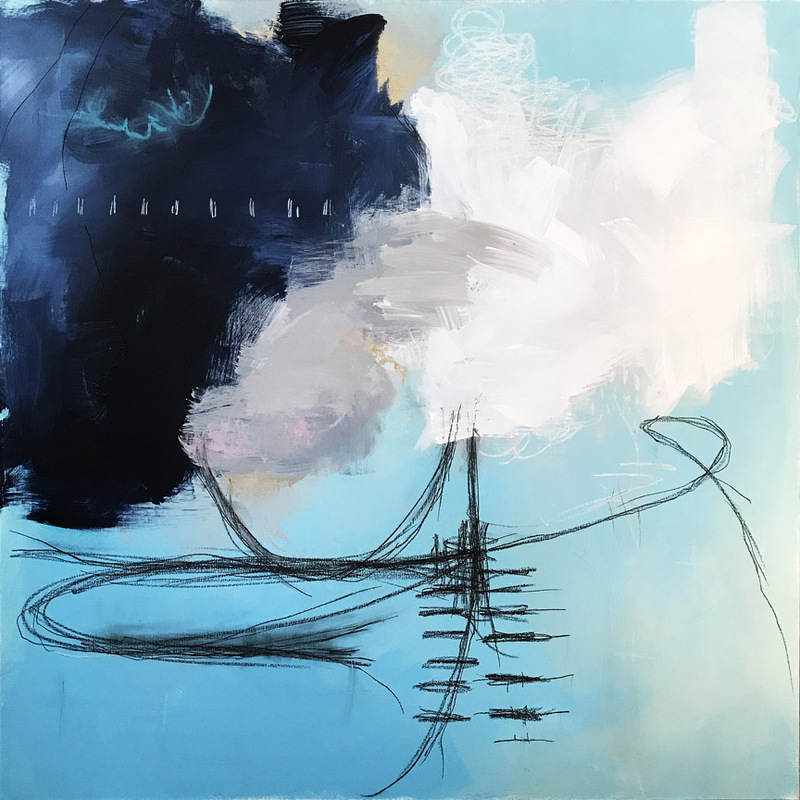 Her fine arts background includes exhibited work in galleries, representation by international art distributor Progressive Fine Art and publication by fine art publishers Verkerke Reprodukties N. V., of Holland. 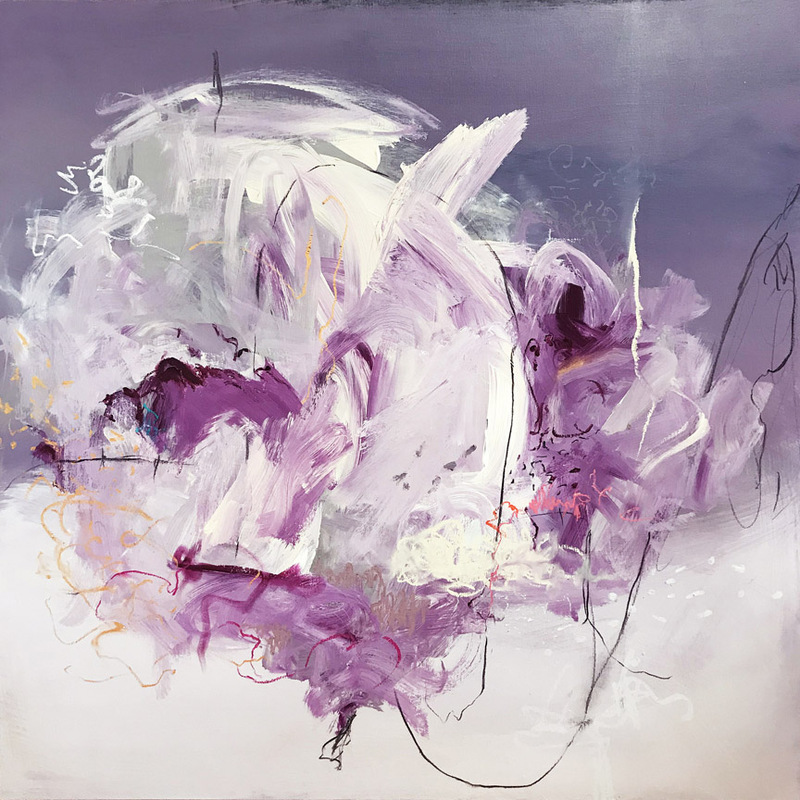 Theodore’s paintings are spontaneous explorations of gesture, form and colour. Compositions are revealed as paint is added and subtracted, scratched and scraped, revealing what lies beneath. The paintings’ foundation is high-intensity colour, and invites an intuitive and visceral reaction. Theodore’s work is included in the Collections Canada website, Women Artists in Canada, and in numerous collections throughout North America. She recently showed at Colorida Gallery in Lisbon, Portugal. Theodore is represented by Muse Gallery in Toronto, Ontario. 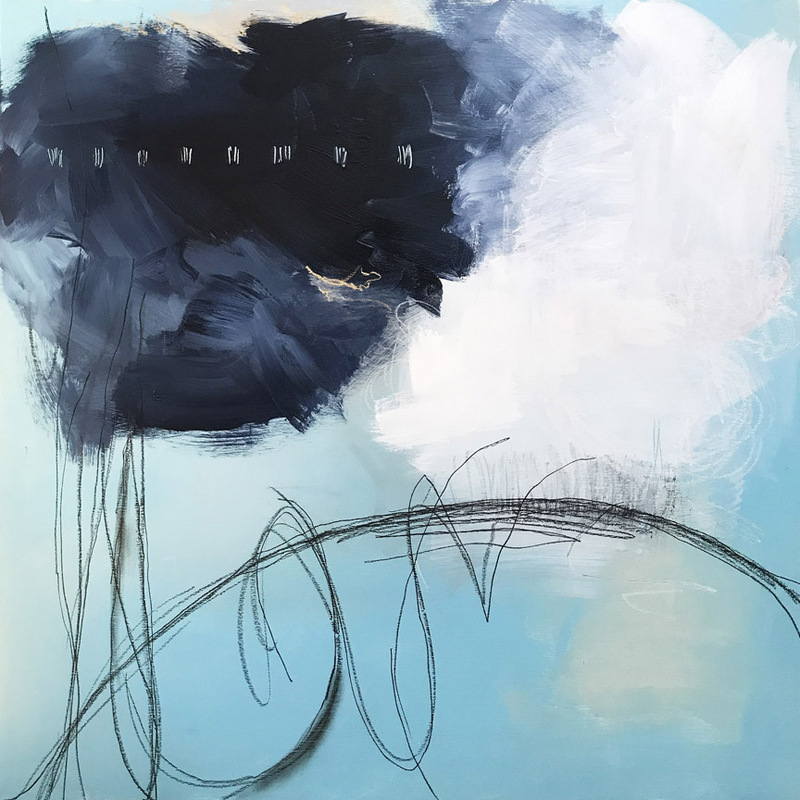 I am Jane Theodore, an abstract painter living and working in Toronto, Canada. I am represented by Muse Gallery in Toronto, and I am a member of two Toronto artist-run galleries – Gallery 1313 and Propeller Gallery. My training is in graphic design, and I had early careers in illustration and print-making. I chose to concentrate exclusively on painting in 2013. I have been making art since childhood. I had an early love of fashion drawing, and designed a lot of slinky evening dresses while watching old movies in the afternoons. And I was a compulsive doodler – scribbling away on every surface. Most memorable was a summer month spent at a cottage when I was a pre-teen. My mother bought me a set of oil paints and canvas, and I remember spending afternoons painting on the front porch. It’s been love – in various forms – ever since. My art practice is an opportunity for me to express what is happening internally. I love the physicality of painting, the swooping arm movements, the furious scribbling. I strive for what the Buddhists describe as “no-mind” – a state that is essentially free of thought, and planning. This suits my personality – a contradictory combination of a desire for structure and a high degree of flexibility. I grew up on the Canadian prairies, and I remain heavily influenced by the memory of those clear, expansive skies. I am excited by the work many other contemporary abstract painters are creating – I think it’s a wonderful time for abstract painting! I filter many sources – colours and patterns I’ve seen, a particularly beautiful sunset or cloud formation – but I don’t seek inspiration from an external source. 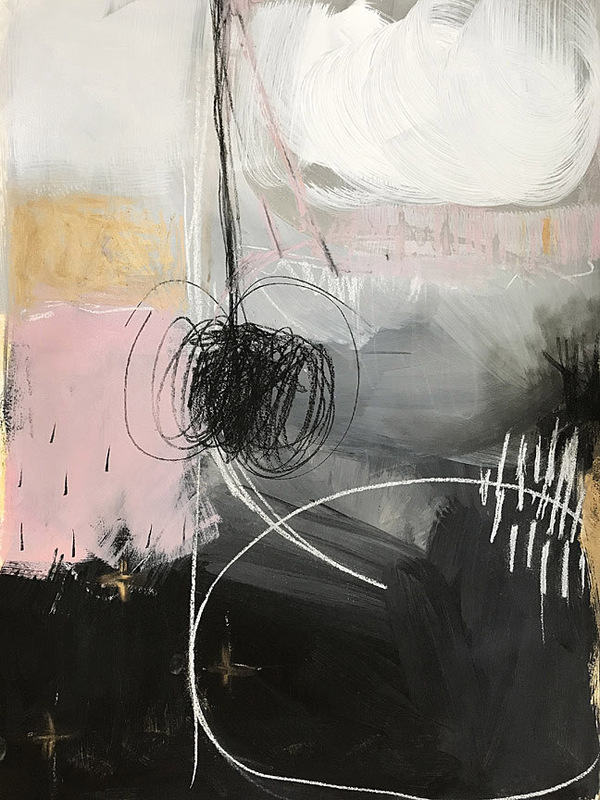 I am interested in the process of painting, so it’s really about creating as often as possible so the work has an opportunity to evolve, and exploring what develops in the process. I appreciate abstraction’s ability to convey emotion. The lack of a representational subject allows the work to be interpreted differently by each viewer. I want people to have their own experience of the work. My hope is the paintings resonate and invoke a response in the viewer that is true for them. When it tells me it’s done. This usually takes a few weeks. After the first flurry of painting and drawing, I pause and live with it for a while. My eyes usually need a break – I am too close to the work during the creation phase – and I pack the painting away for a few days. Then I bring it back out, live with it, and look at it a great deal. I need to get to know it – the painting has to reveal itself to me. At some point, I know it’s finished, or it needs a little more work. Every stage of development has been exciting and rewarding. I was delighted to have work accepted into my first group show, and now I am excited to have representation. Every forward step has been a thrilling stage in the evolution of my career. I work on more than one painting at a time, so the length varies. For example, I will paint backgrounds on two or three paintings, then do the main painting during a second session, and then go back in with other media – oil sticks, oil pastels, charcoal – during another session. I am interested in a more gestural, action-painting approach, so I spend a lot of time warming up, and then do the gestural work in a quick flurry of painting. I strive to complete the painting in one or two sessions so the work stays fresh and the energy is maintained. I spend a great deal of time looking at the work – turning the canvases, living with them – during the creative process, so a painting may take several weeks to complete. I intend to work on larger pieces over the next few months – diptychs and triptychs. Scary and exciting! I am currently working on a group of paintings for an exhibition at Propeller Gallery in April. I intend to expand my market nationally and internationally, in an effort to create a larger audience for my work.